ANNUAL RAINFALL: Varies from 29–39 in. (750–1,000 mm) in the southeast coastal savanna to 59–82 in. (1,500–2,100 mm) in the extreme southwest. GOVERNMENT: Independence from Great Britain, 1957. Republic with president elected by universal suffrage. Governing bodies: 200-member Parliament elected by universal suffrage; Council of Ministers appointed by the president and approved by Parliament. The West African nation of Ghana was the first country in sub-Saharan Africa to gain independence from colonial rule. Known as the “Black Star of Africa,” Ghana was one of the continent’s most prosperous countries in the early years of its independence. However, poor economic management and ongoing political turmoil have taken their toll on this promising nation. Ghana is a flat country with several large rivers and a climate that is mostly hot and humid. Well suited for agriculture, the land also contains rich deposits of gold and bauxite. The overwhelming majority of Ghana’s people make their living in agriculture and cocoa-growing. ACCRA, the capital city, is the center of the country’s political life. Ghana is dominated by flat plains that rarely rise above 1,600 feet. The country has two mountain ranges—along its eastern border with TOGO—but the highest point is less than 3,000 feet above sea level. The country’s largest rivers, the White Volta and the Black Volta, join in the center of the country to form the Volta River. The Volta flows southeast through Lake Volta before emptying into the Atlantic Ocean. Ghana includes several environmental zones, each with a different climate. In the north are the Guinea savanna and the Sudan savanna, which have a single rainy season and relatively little rainfall. The southern part of Ghana is divided into high rain forest, deciduous forest, and coastal savanna. The south has two rainy seasons. The forests receive fairly high amounts of rainfall, but the coastal savanna is the driest region in the country. In the center of the country, the forest-savanna transitional zone is wetter than the north but drier than the forests of the south. The Sudan savanna in the north is the hottest part of the country, and the high rain forest of the south is the coolest. However, temperatures remain relatively constant throughout Ghana, ranging from 70°F to 95°F, and the humidity stays fairly high most of the year. Ghana’s economy is still based on the most important industries of its colonial period, gold mining and agriculture. Gold continues to be Ghana’s main source of foreign earnings. Diamonds and bauxite, an aluminum ore, are also mined in Ghana. Aside from the gold industry, though, mining and manufacturing play a fairly small role in the national economy. However, the country has a developing petroleum industry. Ghana’s agricultural exports include cocoa, pineapples, kola nuts, cottonseed, and palm kernels. Prior to colonization almost all of what is now central Ghana was part of the ASANTE empire. The coastal strip was inhabited by the Fante and Ga peoples. The first Europeans to arrive in the area were the Portuguese, who built forts on the coast in the late 1400s and traded for gold. Over the next centuries, the English and Dutch also established trading posts. Enslaved Africans were a major export of the region’s European traders, with figures at one point reaching some 10,000 slaves a year. After the British outlawed the SLAVE TRADE in 1807, they formed alliances against the Asante, who were considered the main source of slaves. The British made Ghana a colony in 1874, naming it the Gold Coast after its most important export. By 1901 they had conquered the Asante and the land north of the Asante kingdom. Modern Ghana consists of the British Gold Coast colony, plus the western part of the former German colony of Togoland, which passed to British control after World War I. Resistance to British rule began in the late 1800s, especially among educated Ghanaians. However, no significant movement toward independence occurred until after World War II. Kwame NKRUMAH, leader of the United Gold Coast Convention (UGCC), was Ghana’s first important national political figure. In 1949 Nkrumah started the Convention People’s Party (CPP), which called for complete independence for Ghana. After the CPP led a series of strikes and boycotts, the British jailed Nkrumah. However, to calm the political unrest, Britain made provisions for Ghanaians to have a local representative government. Nkrumah was allowed to run for office. When the CPP won an overwhelming victory in the first elections, Nkrumah became prime minister. At the time a British colonial governor still held ultimate power. In 1954 a new constitution provided a framework for self-government for Ghana, and the CPP won control of a newly elected assembly. The National Liberation Movement (NLM), based in the central Asante region, challenged Nkrumah and the CPP, leading to demonstrations and widespread violence. In 1956 the British called new elections. Although the NLM and its allies did well in the north and the Asante country, the CPP won the overall vote. On March 6, 1957, Ghana became an independent country with Nkrumah as its first president. 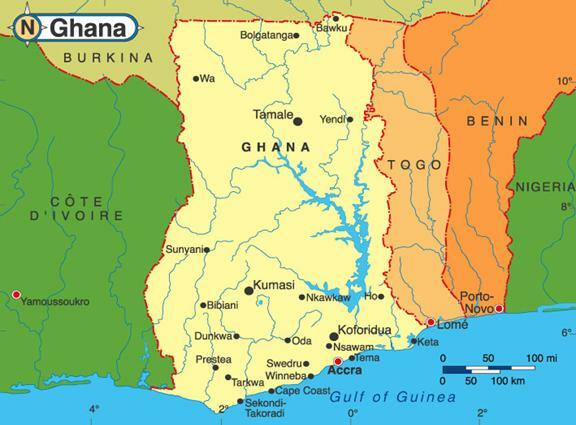 The name Ghana—taken at independence—came from the first medieval empire of West Africa. However, modern Ghana has no actual ties to the historical Ghana. At the time of independence, Ghana had one of Africa’s strongest economies. The CPP did not nationalize many existing private businesses, but it did create several state-owned industries and farms that proved costly and inefficient. Nkrumah took steps to expand Ghana’s industrial sector and to provide free public education. These programs were funded by taxing the agricultural sector and borrowing from foreign countries. As Ghana’s debt grew, so did government corruption. In 1964 Nkrumah outlawed all political opposition, and Ghana became a one-party state. Two years later, military leaders overthrew Nkrumah in a relatively bloodless coup. The new military regime sought to undo many of Nkrumah’s policies. It sold off the state-owned businesses and devalued Ghana’s currency so that its exchange rate reflected its actual value in world markets. When elections were held in 1969, Kofi BUSIA became prime minister in the restored civilian government. Busia continued the free-market policies of the military government, but the economy did not respond and unemployment continued to grow. Three years after giving up power, the military again seized control of the government. General Ignatius Acheampong, leader of the military government, revalued Ghana’s currency and refused to pay its foreign debts. Though highly popular within the country, these steps proved a disaster for the economy. In 1977 Acheampong promoted a plan called Union Government that gave some power to citizens but kept most power and control with the military and police. The plan led to strikes and demonstrations, forcing Acheampong to resign. His successor, General Frederick Akuffo, agreed to a return to civilian rule, and Ghana prepared for new elections in 1979. Shortly before elections were held, junior officers led by Air Force Lieutenant Jerry J. Rawlings attempted to seize control of the government. Although Rawlings was arrested and jailed, a group of supporters soon broke him out of jail. Rawlings took control of the military government, but he agreed to let the elections proceed as planned. The voters chose Dr. Hilla Limann as president, and his party won a majority of seats in the assembly. As agreed, Rawlings handed power to the civilian government. Limann was unable to cure the ailing economy or to control unemployment and corruption. His rule lasted only two years before Rawlings took over again in 1981. This time Rawlings outlawed all political parties and dissolved the assembly. He and his supporters formed the Provisional National Defense Council (PNDC) to run the country. In its early days, the PNDC called for a “people’s democracy” based on states such as LIBYA and Cuba, but economic and political unrest created a constant state of crisis. Political violence, kidnappings, and assassinations were common. Meanwhile, the PNDC’s economic policies brought the nation to bankruptcy. These policies and HUMAN RIGHTS abuses brought fierce opposition from civilian organizations, students, trade unions, and some parts of the military. Faced with severe economic problems and foreign debts, Rawlings agreed to economic plans drawn up by the World Bank and the International Monetary Fund. Under these plans the currency was again devalued, foreign loans were repaid, tax policies were changed, restrictions on foreign imports were lifted, and foreign investment in the economy was encouraged. By 1990 Ghana had paid off its foreign debt and economic activity had rebounded. However, while foreign investors and the upper levels of Ghanaian society saw the benefits, Ghana’s workers and farmers bore the costs. Once again the people called for a return to civilian government. In 1992 a group assembled by the PNDC approved a new constitution, and national elections were held. Rawlings, who ran as a civilian candidate, won the presidency with nearly 60 percent of the vote. Independent observers judged the elections to be fair, but opponents disagreed and boycotted the parliamentary elections that followed. As a result, Rawlings and his allies won 90 percent of the seats in the assembly. Despite continuing political unrest, Rawlings was elected for a second term in 1996. Yet, in 2000, Rawlings stepped down after losing a country-wide election in favor of President-elect John Kufuor. Ghana can be divided roughly into two major cultural groups: one group in the northern savannas; the other in the southern savanna and forests. However, some ethnic groups from central Ghana share elements of both northern and southern cultures. There are also cultural differences between eastern and western groups. For example, groups of central and western Ghana are matrilineal, meaning that property and political power pass through the female side of the family. Most northern and eastern groups follow a patrilineal pattern, passing inheritance rights through the male side of the family. However, the north-south cultural differences are much stronger than those between the east and the west. Northern Ghana has three regions. In the Upper East Region, the main ethnic groups are the Bulsa, Nankani, and Gurunsi. The Upper West Region is home to the Dagaba, Dagara, Wali, Chakali, and Sissala. The Northern Region is dominated by the Dagomba. These groups have different names depending on their relation to ISLAM. Traditional Muslims, converts to Islam, and nonbelievers all are referred to by different names. Islam is well established in the larger northern towns, while traditional African religious practices based on ancestor worship are common in the rural areas. Polygamy is part of the culture of some non-Christians in this region. Most but not all peoples of northern Ghana speak languages of the Gur family. Gur is also used by some ethnic groups in central Ghana, along with Gurunsi and Gonja. Some peoples in central Ghana speak a dialect of the Mande language. The north includes several kingdoms ruled by hereditary chiefs. Although the social structure has been heavily influenced by Islam, not all chiefs are practicing Muslims. The northern groups that have formed kingdoms also developed towns. Groups that do not form kingdoms live in small settlements, led by heads of households rather than by a chief. The most important social event in northern communities is the funeral, which may last for several days. Marriage is an occasion for public celebration and often includes a ceremonial kidnapping of the bride. Married couples in northern Ghana usually live with the husband’s family, and rights to property and political power are typically passed through the male side of the family. The peoples of southern Ghana include the Asante, Fante, Kwahu, Akyem, Brong, Agona, and Akuapem. Most southern Ghanaian peoples share features of the AKAN culture, including the Akan language and matrilineal social system. Property and political office pass through the mother’s side of the family, and wives often live with their mothers after marriage. Marriages are not celebrated publicly, but one of the more important rituals is the girls’ coming-of-age ceremony. Most settlements in southern Ghana are villages organized into small states or kingdoms. While the kingdoms of the north were established by outside groups, the Akan states of the south are native to the region. Even non-Akan peoples of the south organize their states along the Akan model.